If you're looking for a big cuddle buddy or a stuffed animal that makes a huge impression then you need look no further than the Jumbo Cuddlekins stuffed animals by Wild Republic. These large plush animals are made with soft, floppy bodies and adorable faces that generate big smiles and even bigger hugs. The top quality plush and durable construction allows for lots and lots of high quality cuddle time. Jumbo Cuddlekins are not interested in short term friendships, they like to stick with their owners for years and years! Posed in lying positions, with the exception of the two stuffed giraffes, jumbo stuffed Cuddlekins are primed for late nights on the couch, afternoon naps, bedtime stories, and imaginative adventures. If you can dream it up, your Jumbo Cuddlekin will surely join in the fun. With the awesome selection of animals available as jumbo plush Cuddlekins you can have tons of different adventures too. There are lots of big cats to choose from, jungle animals, bears, and even a wolf and a tree frog. What kind of adventures would a jumbo stuffed tree frog embark on? Well, that's up to you, but there is a whole world of exciting possibilities. 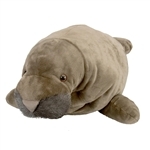 Whether you are at play or at rest, you will always get tons of enjoyment from any one of the Jumbo Cuddlekins. So, if you are looking to go big, go with a Jumbo Cuddlekins stuffed animal. You won't be disappointed!